Fine Dining and Easy Access! 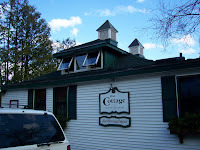 I had a great meal last night at one of Lake Placid's fine restaurants, The Caribbean Cowboy. They make some of the best sweet potato french fries ever. My friend who was visiting from out of town remarked how nice it is to have such great restaurant choices all within a few miles or walking distance of Lake Placid. It was then I realized I was guilty of taking something in this paradise I live in for granted! I honestly thought I had a thorough appreciation of all the wonderful attributes of this incredible Adirondack Lifestyle. Clearly, I was mistaken, as she pointed out. She reminded me that we have a plethora of restaurants offering a multitude of choices from juicy burgers to sushi to four start gourmet fare, all within walking distance of the Village of Lake Placid. So, there you go - I learned the lesson not to take something so essential to the good life, yummy food, for granted! And you learned you really need to plan a trip to the Adirondacks to try out some of this easy access fine food.